There’s something about mixing art and nature that’s just irresistible. 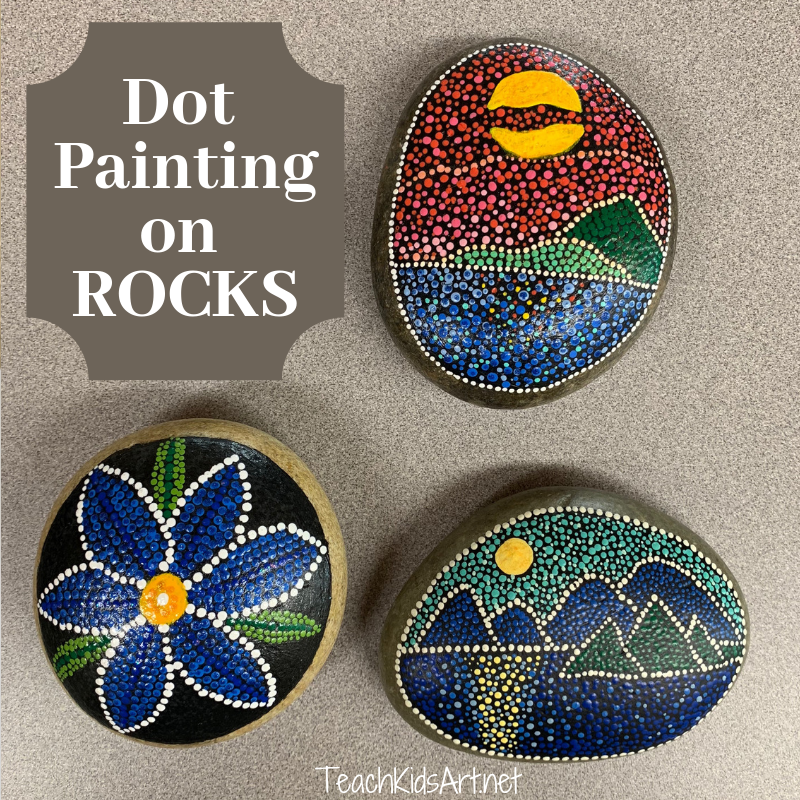 So when you combine rocks with dot painting, you can’t go wrong! 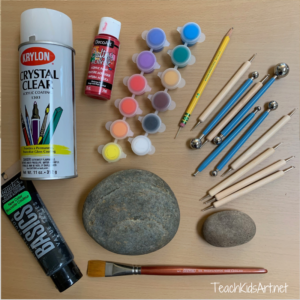 While the painted rocks in this post were done by an adult (my friend, Tricia), kids love it, too! 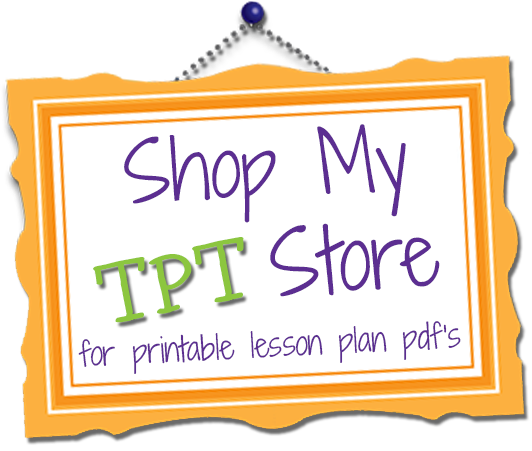 This project is perfect for a Mother’s Day, Father’s Day, or Valentine’s Day gift, an after-school or Mom’s Night Out project, or even your school fundraiser. Hiding small painted rocks in public places for random people to find is especially fun! Do you have a large group and limited time? Then consider painting the black background ahead of time so that your artists can get right to the fun part without having to wait for the background paint to dry! Dotting tools in a variety of sizes – groups of kids (or adults) can share! You can make a homemade dotting tool by sticking a pin in the end of a pencil eraser if you want to try this technique before purchasing a set. Wash your rock and let it dry completely. 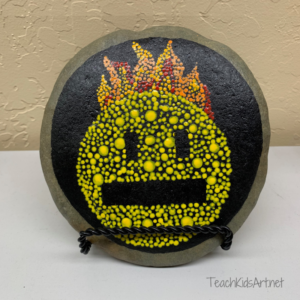 Paint the top of your rock black. The dark background will help your colors “pop”! Choose a simple design and lightly sketch the main shapes with a pencil. Start making dots! You can outline your shapes and fill them in from the outside-in, or work from the center out. Vary the sizes of your dots and experiment with placing different colors next to each other, a.k.a. “visual blending”. This style of painting is called “Pointillism“(see the work of Georges Seurat for examples). After your rock is completely dry, paint or spray both sides with a clear acrylic sealer to preserve your masterpiece! 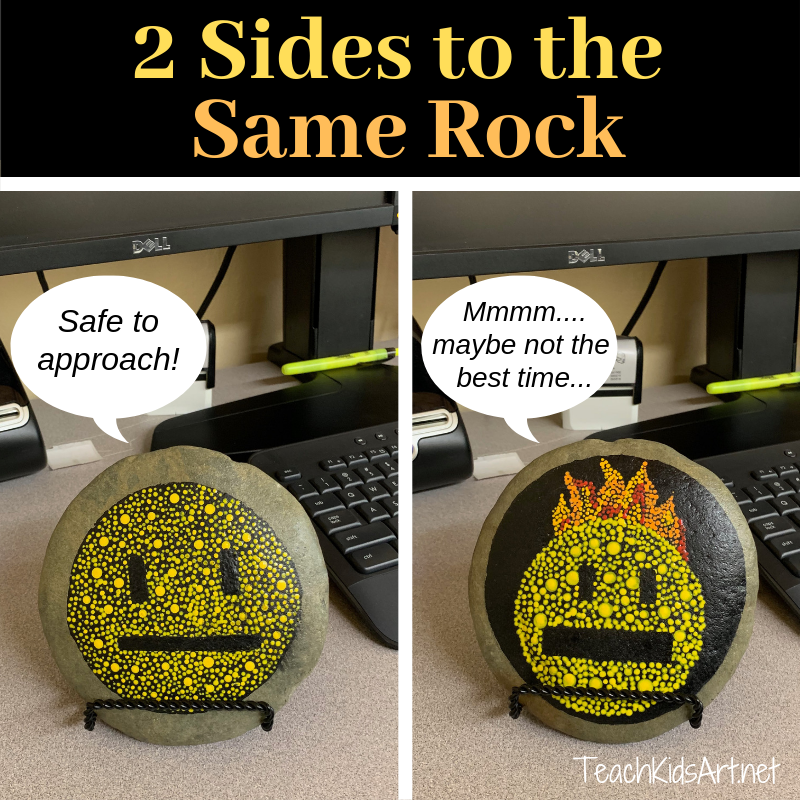 My friend, Tricia, displays these rocks on her desk at work, which inspired her boss to paint a rock of his own. 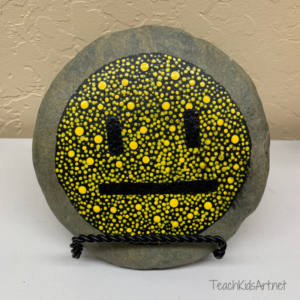 His painted rock is two-sided, and lets everyone know what kind of mood he’s in before they interrupt him…. gotta love his sense of humor! There’s no guessing here if it’s a good time to interrupt someone with a question!